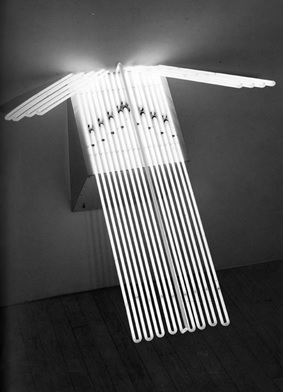 White Hanging Neon," 1966. Neon, aluminum support, 35"×30"×36". Stephen has always been a presence in my life, for as long as I can remember. He continues to be present in my memories and heart, so in that sense he remains. I’m sorry I won’t get to see him in the flesh again, but I know he remains inside others just as he does for me, and I take comfort in the fact that the works he produced in his 87 years will continue to have lives of their own long after he, and the rest of us, are all gone. I don’t remember Stephen ever saying anything I couldn’t agree with in spirit. I often saw him at large family-style gatherings; he was never loud. He was quiet, observant and kind. He would usually pull you to the side to speak, and was always thoughtful, deliberate, and precise. Many of our conversations had to do with the making of art, or the attempt to do so. He would often leave harder to verbalize aspects of the process unspoken, but with a gesture and a few words, he let you know that he knew you, understood. It was generous of him, and comforting for me, to be able to connect with him. He was, and is, still is very special to me. Stephen Antonakos is a warm wonderful friend. He electrifies our lives as he lights up our front hall! One of the moving and compelling aspects of Stephen Antonakos’s series of pillow sculptures and drawings from 1962 to 1963, exhibited earlier this year at Lori Bookstein Fine Art Gallery, was the fact that so many of them are dated with a particular date. “March 26, 1963.” As if to ask, “Where were you?” and its corollary, “Who are you?”, Stephen’s dated Pillows, unlike, in a sense, his later series of date-stamped Travel Collages, are not “about” the day on which they were made, although they are spoken through it. They transform diverse, not un-Freudian materials that were on hand in the studio that day: pipes, nails, screws, buttons, ropes, balls, dolls, clips, into feelings and images arising both from the objects themselves and from his unconscious, as the leitmotif of the pillow and the often-repeated word “Dream” make explicit. Pillows are a diary of dreams, an underground stream suggesting that life is not always lived where we think. Stephen’s later series of date-stamped Travel Collages are shrines of and to particular days, the day on which he picked up this stone, that leaf, that wrapping. Seemingly uncomposed or casually composed, like the day itself, “a day like any other” on which encounters and feelings chance to fall, they acknowledge, as do other aspects of his multiplicitous work including his better-known neon sculptures and environmental works, the fragmentary, the missing, the flawed, the hidden, the accidental, the incomplete. The unknown date that waits for each of us. “A few days / are all we have,” wrote James Schuyler, poet laureate of the daily. Some deaths seem particularly unfair and unthinkable, and Stephen Antonakos’s was one of those. “We see us as we truly behave” and Stephen was, as he seemed to be: truly nice, modest but self-assured, generous. He had a distinctive and beautiful voice: something New York, something foreign, slightly nasal, quite precise. After knowing him a while, one realized he was quite short. It didn’t particularly register at first: maybe his presence had the same rightness of scale as his work. Stephen was also an unusually sweet man. Which may sound merely anodyne, or even a liability—aren’t we often more interested in “difficult” people when it comes to artists and other creative types? In Steven’s case sweetness was both genuine and—how to say this?—creative. Not a manner, but a manifestation of grace that was of a piece with his work, and maybe also with the priorities implied in his and Naomi’s all-white loft (walls, ceiling, floor) and minimal personal surroundings. He had a purity of heart, which imbued the work. At Stephen’s funeral in the compressed, golden Greek Orthodox church on East 17th Street, many people, I think, were struck by the realization that his coffin at the altar was now another of Stephen’s Packages, those mysterious wrapped parcels which he mailed to friends with instructions to open them on a certain day or under certain conditions or not at all. What do they contain? This one was labeled with his own name and contained a body that was “him,” but all the wrong color. He had always used his own future death, with a combination of prescience and thrift, as the date on which certain of his Packages were to be opened. Faith, no less than light or time, became a material in Stephen’s work—faith that the recipient would open or not open the package as directed, that the viewer’s imagination would complete (or not) the fragmentary neon circle or square. As a man and artist of the Christian faith, he believed that his final Package will be opened into a blaze of light.